Relax with the convenience of a gas log fire on the main level, or play a game of pool in front of a wood burning fireplace on the lower level. With 4 private bedrooms on 3 levels and full baths on the main and lower level with a half bath in the loft, families have plenty of room to spread out. There is spacious parking for at least 4 cars without a steep driveway. Large deck with hot tub and winter views. Leave the sizzle of summer while enjoying shady mountain breezes with occasional sightings of bears. Ideal for adult retreats. Guest Services at Chalet Village Owners Club: All guests have the use of facilities at the Chalet Village Owners Clubs. The South Club is located less than a mile from Bear Haven. The North Club is located about 1 1/2 miles from Bear Haven. The clubs have outdoor swimming pools, which are open in season which is roughly Memorial Day to Labor Day. There are also game rooms and tennis courts. My wife and I are both educators. We bought Bear Haven primarily as a retreat to share with our sons. I grew up going to the Smoky Mountains on a semi-regular basis. Some of my favorite childhood memories are fall visits to see the leaves and nights walking the strip in Gatlinburg. We love the location since my sons and I hike and fly-fish in the mountains, while my wife and daughter-in-law have access to unlimited shopping and bargain hunting in the area. We love the tongue and groove paneling and the stone fireplaces. The deck is a nice place to relax under the shade of trees in the summer. While we have neighbors within sight, this is in an older section of Ski Mountains where the cabins are more spaced out. Bathrooms are located on three different levels. Pet-free Swimming Pool and Tennis are located at Chalet Village Owner's Clubs, which are minutes away from the cabin. Very nice clean place to stay. Easy drive on newly paved roads. I would be happy to stay again. The owner is very quick to respond and answer questions and follow up to make sure everything was enjoyable. Great customer service, great place. They even have pizza delivery available. I recommend this place! We loved the location - so close to everything! There was plenty of room for our two families of four. It is nice to have a fully-equipped kitchen. We really enjoyed staying here. There was plenty of space- we originally picked this location as there were 9 in our party, but only 5 ended up coming, but if everyone had been able to make it out I’m sure we would not have felt cramped. The cabin was very clean. Plenty of linens and dishes. It’s not a very crazy drive up the mountain, but of course, it’s still a mountain! There was plenty of space in the driveway for two large vehicles, and it was very easy to turn them around. If you’re looking for a place on that side of Gatlinburg, then this is a great option! We loved our stay here. Easy access to town and also the national park. The cabin was clean and spacious. We loved unwinding at night playing a game of pool or relaxing in the hot tub. We would definitely stay here again. The chalet was absolutely beautiful and the location is fabulous!! 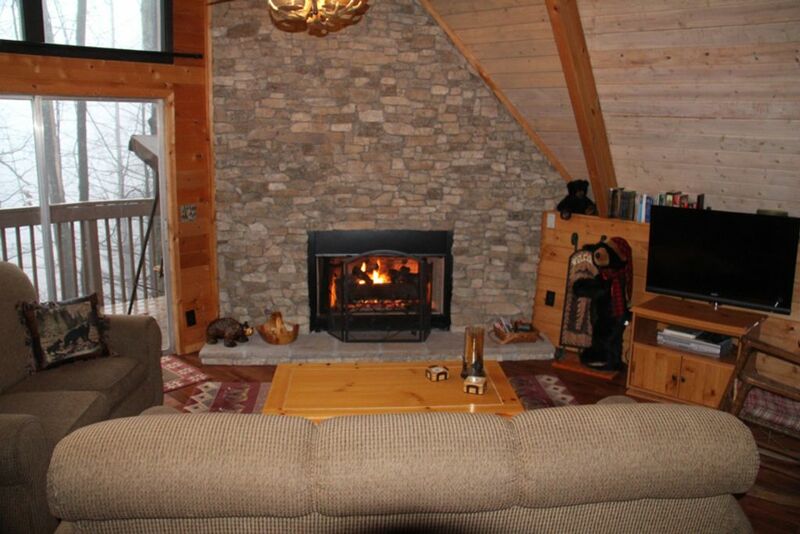 Wonderful mountain chalet just minutes from downtown Gatlinburg and a walk to Ober Gatlinburg ski resort. Our family of six adults had a wonderful time spending the Christmas holiday at this property. We will absolutely go back to this property and we all highly recommend it to anyone looking to enjoy a nice mountain vacation. 2.5 miles from traffic light 10 in Gatlinburg, easy access to Great Smoky Mountains National Park, 20 minutes to Dollywood and Pigeon Forge, minutes to Ober Gatlinburg, convenient to Outlet Shopping. 2 night rentals will have a $75 cleaning fee added. 7th night is free and is figured in the weekly fee. Cancellation Policy: For HomeAway service fee, see HomeAway policy. Cancellations prior to 60 days before arrival are refunded 100% of what has been paid in rental fees/damage deposit/taxes. Cancellation between 30 and 60 days before arrival will be refunded 75% of what has been paid in rental fees/damage deposit/taxes. Refunds for cancellations less than 30 days depend on whether property can be re-booked or not.